The Pozo River Vigilance Committee at Lazy Arrow is a Cowboy Action Shooting™ (CAS) club and range located on the 32,000 acre Camatta Ranch in Santa Margarita, California. Members of the club meet monthly for scheduled shooting events where they test their skills and agility against the clock. In addition to participating as cowboy shooters, our cowboys and cowgirls serve as timer operators, spotters, loading officers, and unloading officers. Our over-arching mantra is safety, and we diligently adhere to the standards and range safety procedures of the Single Action Shooting Society (SASS) and the National Rifle Association (NRA). 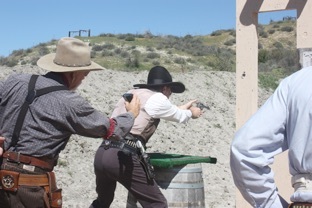 To heighten the Wild West experience, our cowboys and cowgirls shoot single action guns that are either originals or replicas of guns used prior to 1900. And, as you’ll notice in the photo, our attendees are dressed in garb that replicates the style of clothing worn in the Wild West during the late 1800s. Single Action Shooting Society (SASS). features a set of steel targets (re-positioned for each match) that shooters fire upon in carefully scripted scenarios with pistols, rifle, and shotgun. Our first 7 bays are separated by 6’-high dirt berms for safety between the 30’-wide bays.